Should we renovate our existing landscape, and if so, what changes will be the most rewarding? We have a few tips to help you answer that question. First, we’ll look at what drives changes to landscape design trends. Just like kitchens and bathrooms, wallpaper and upholstery, what’s ‘on-trend’ for landscape design is in constant flux. We follow interior and architectural trends closely to stay on top of what’s fresh - they influence everything from outdoor furniture styles and color to paving and finishes. Innovations in horticulture present incredible new planting options every season. Technology transforms how we spend time outdoors. And climate change affects every aspect of planting selection and maintenance. In addition to evolving tastes, the living things in your landscape are constantly growing and changing. Your landscape becomes something different over time - a favorite sunny spot may become shaded by a tree originally designed as a colorful accent. With growth comes changes to your landscape character. It may no longer reflect your lifestyle. This year, we took some remarkable ‘after’ photographs to show you a dramatic style update. The changes we designed for this couple (with whom we have worked for 20+ years) were motivated by climate change, growth, and style. When we started working with them in 1997, we assisted with the master plan of their property, making sure to include key program elements such as circulation, outdoor dining, seating around an existing pool, and colorful plantings. 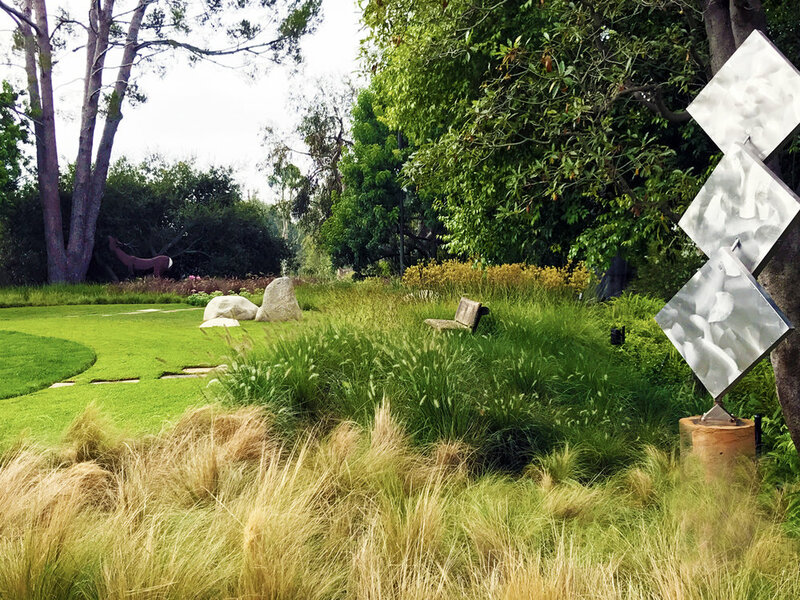 A decade later, in 2008, we renovated the landscape to a more sophisticated look- one that reflected their passion for the California Arts and Crafts movement and the Sycamore ravine adjacent to their property. But in 2015, the water crisis hit California. We redesigned plantings in nearly every area of the site to reduce water consumption, and in the process, rejuvenated the style and feel of the property. We couldn’t resist offering a sneak peek into what it looks like now. Before: Turf and perennials surround a kinetic sculpture by George Rickey. is now Kurapia, a drought-tolerant turf substitute. and Kurapia replace much of the turf. After: Nessella (Mexican Feather Grass) in the foreground and Kurapia beyond. After: Kurapia in the foreground and sesleria autumnalis, Carex divulsa, Pennisetum 'Eaton Canyon' and Kangaroo Paws. Is the way you live outdoors ready for a refresh/update? How does your family spend time outside together? Does the layout of your space make it easy to do the things you like to do? Is there anything you like about your existing space? What kind of maintenance are you willing to put into your outdoor space? Have there been recent interior or architectural updates to your home? At Barker Evans Landscape Architects, we’re always ready to help you explore how to live more abundantly outside. Let’s talk about what we could do together.